How Do I Know If I Have a Dust Mite Allergy? 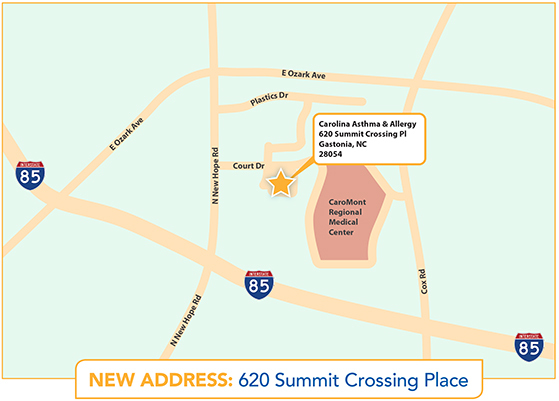 Our Gastonia office has moved to a new location to better serve you. Our Gastonia office is conveniently located in the middle of Gaston County, nearby McAdenville and Belmont. Four board-certified allergists currently see patients for allergy testing, allergy care, and asthma treatment five days a week at our Gastonia allergy clinic. Our shot room is open also Monday through Friday for patients undergoing Immunotherapy (allergy shots) for allergic symptoms. Contact us to schedule an appointment with an allergy specialist to diagnose your skin allergy, food allergy, drug allergy, and asthma symptoms.